Migrant caravan used as theater, but no major threat to U.S. Updated at 10:22 p.m. on Thursday, Nov. 1, 2018, with more information. 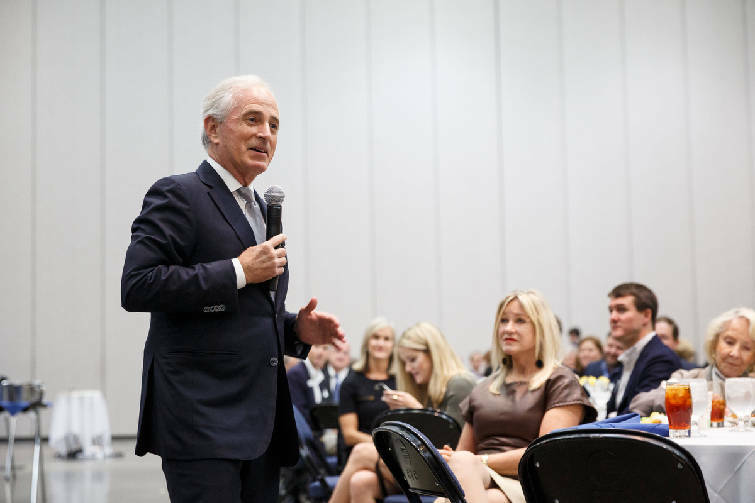 U.S. Sen. Bob Corker speaks during an appearance at the Rotary Club of Downtown Chattanooga's luncheon at the Chattanooga Convention Center on Thursday, Nov. 1, 2018, in Chattanooga, Tenn.
As he wraps up his 12 years in the U.S. Senate, Bob Corker offered his assessment of the three presidents he has served with in Washington. * George W. Bush: “He’s a great human being — the kind of person you would like to have for dinner at home. For someone who has been president, he is a pretty low-key guy,” Corker said. The attacks on 9-11 changed his focus on being a “compassionate conservative” to fighting the war on terror and ultimately the controversial war in Iraq. Corker said Bush was not as intellectually curious as he would prefer and didn’t always get the best advice from those around him. U.S. Sen. Bob Corker said Thursday that the United States needs to enforce its borders, but he said the focus by President Donald Trump on the migrant caravan from Guatemala heading to the U.S. border is more political theater than a significant threat to America's security. "I have never met, seen or known an immigrant that I am angry at because they want to come to the greatest nation on Earth to escape Central America where people are being raped, necks are being slit, people are being tortured and there is unbelievable corruption," the Tennessee Republican said to applause Thursday from the Rotary Club of Chattanooga. "Much of this is theater. This has turned out to be an issue that obviously revs up the base." Trump, who ordered 5,200 troops to the U.S. border on Monday to aid border patrol agents with the caravan and other illegal border crossing attempts, told reporters Tuesday he could deploy "anywhere between 10 and 15,000 military personnel — on top of Border Patrol, ICE and everybody else at the border" to turn back the thousands of Guatemalan refugees now walking north through Mexico to the U.S. border. But Corker, chairman of the Senate Foreign Relations Committee, said he doubts that number of military personnel ultimately will end up at the border or be needed to stop the caravan. "We do, in fact, need to make sure that our borders are maintained, but I would suggest that nowhere near that number ends up happening," he said. Trump said, "Democrats have let immigration in our country get out of control" by not allowing votes on stricter border limits and refusing to support the building of a wall between the United States and Mexico. The GOP candidate trying to succeed Corker in the U.S. Senate, U.S. Rep. Marsha Blackburn, is running television ads criticizing her opponent, former Gov. Phil Bredesen, for not supporting building a wall across the southern border and for not taking the threat from the migrant caravan more seriously. Bredesen has said that "a few thousand very poor people" are not a threat to U.S. security, but Blackburn's ads warn that the caravan could include "gang members, known criminals, people from the Middle East, possibly even terrorists." Blackburn favors building a wall and doing more to enforce border security. In a luncheon speech to the Rotary Club here for which he once served as sergeant-at-arms, Corker lamented that during his 12 years in the Senate a comprehensive immigration reform package was not passed in Congress. "Both sides of the aisle have used immigration as a political football," Corker said. "We know what we have to do. It's almost like we attempt to not solve the problem so it can be used for political advantage." Corker said 40 percent of the illegal immigrants in America come to the United States by overstaying their visas. "These people have passports and we know who they are, so there just hasn't been a real desire to solve this problem," he said. Corker said a friend of his from Knoxville told him that he understood a wealthy Democrat was financing the caravan moving thousands of emigrants from Guatemala. "I said, 'Are you kidding me?'" Corker said. "If anyone is funding this it is probably a wealthy Republican, because it has turned out to be an incredible base-arousing issue." Trump is expected to talk about the immigration threat in his appearance in Chattanooga on Sunday, but Corker, who said he had a previous engagement, will not be at the rally. While Corker sounded a different note on immigration than Trump and Blackburn, he did voice support for the administration's ongoing efforts in both North Korea and Iran. "There is reason to think that there is a possibility — with tremendous caution around that possibility — that something might happen that will be good for our country," Corker said. "Nothing tangible has really happened yet, but I am more optimistic today than I would have been before the Singapore summit occurred, which we all know was more of a press conference than anything. There [have] been more substantive discussions and North and South Korea seem to be working together much better." South Korean President Moon Jae-in said Thursday that North Korean Leader Kim Jong Un soon will visit Seoul as part of ongoing diplomatic efforts to rid North Korea of its nuclear weapons. Moon said a North Korea-U.S. summit is "near at hand." Kim and President Trump, who met in Singapore in June, are trying to arrange another meeting early next year after a fourth trip to North Korea last month by Secretary of State Mike Pompeo. Corker said he is encouraged by the appointment in August of Ford Motor Co. Executive Steve Biegun as U.S. envoy to North Korea and recent talks by U.S. diplomats with North and South Korea. "I am very impressed with the special envoy who has been put in place, and Pompeo has a unique relationship with the president and has established a good relationship with Kim Jong-un," Corker said. Corker also voiced support for the president's decision to cancel the Iranian nuclear arms deal. Corker, who authored legislation to put in place a process for lawmakers to review and eventually vote on the deal that President Barack Obama negotiated with Iran, was blamed last year by the president for helping Obama negotiate the treaty even though Corker opposed the deal. Despite differences with the White House on how to restructure the treaty, Corker credited Trump for scrapping the agreement, even though many European allies, including Germany, disagreed with the move. "Honestly, I think what they have done is better and is going to lead to a better outcome," Corker said. "I don't think that [Iran] is going to get the investment from Europe that they expected and the country itself is divided right now and its economy is in terrible shape."